It’s no surprise that drones are being used as tools of war. They’re designed to go places too dangerous or risky for humans. They drop bombs; they surveil secure locations. But perhaps it’s more surprising that the drones themselves are becoming the plane on which conflicts play out. 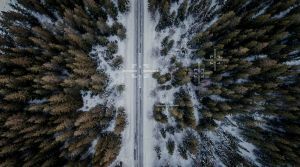 As drones accomplish increasingly sophisticated tasks, more companies spring up to hack them and take them out of the sky, according to a recent article in CyberScoop. Drones are a security nightmare. Equipped with sensitive electronics, they can maneuver into places larger devices can’t, and do so unnoticed. Those equipped with cameras can fly over prisons, private homes, war zones, or clandestine factories, and take a snapshot or two that the property owner may not like. Some drones can even see through walls, creating high-resolution floor plans of the facility inside. Information like that could be useful for countries spying on one another, for journalists looking to reveal harmful manufacturing practices — or terrorists scouting out facilities before an attack. “Drones cause problems for more and more types of secure sites, whether it’s a matter of irresponsible or nefarious operators […] taking photos where you shouldn’t be taking photos or putting people on the ground at risk,” Nimo Shkedy, the CEO of ApolloShield, a company that creates anti-drone systems, told CyberScoop. The drones aren’t just hazardous due to the kind of information they can reveal — the drones themselves could be used as weapons. “At places like stadiums or oil refineries, a crash can be fatal,” Shkedy added. Naturally, people are trying to figure out creative ways to safely rid the skies of the pesky gadgets. The simplest solution is to shoot them out of the air (or have your trained bird of prey do it for you), but there are questions as to whether the former is legal. And the process might end up causing unintended damage to your property. Digitally hijacking drones — yes, hacking them — might provide an elegant solution. Drones may be versatile, but they’ve also proven to be quite vulnerable to cyber attacks. When engineers create the drones, it seems they don’t take measures to defend the devices from hacking – the way other gadgets, from computers to cell phones, have built-in protection. ApolloShield is one of a the growing number of companies that wants to take drones down with hacking. The company’s CyberBox technology promises to do “all the magic” in detecting and taking control of unauthorized drones that end up hovering over a private space, no matter the reason. Using radio frequency jamming techniques and denial-of-service attacks, the technology forces wandering drones to land. But ApolloShield isn’t alone. Two Israeli companies — Elbit Systems and Israel Aerospace Industries — have also entered the fray. After years of hacking African political dissidents, the former created an anti-drone product called ReDrone that specializes in hacking and diverting drones; the latter makes a drone detection and disruption system called DroneGuard, which has been on the market since 2016. Another drone hacking system from Selex, an electronics company based in Italy, is designed to work in cluttered, urban spaces. The company’s Falcon Shield Counter UAV system promises to keep unwanted drones at bay using radio frequency to disrupt or take over a drone’s function. Of course, if you’re a hacker yourself, you might not need any of these products. But some experts predict these anti-drone tools will become extremely popular in the next couple of years, becoming a nearly $2 billion market by 2024. For now, companies are primarily marketing their drone-hacking services to organizations with facilities they want to keep a bit under wraps. But it’s not hard to imagine that individual property owners might be interested, too. As more drones flood the skies, and regulators struggle to keep up, homeowners might want ways to get the hazardous gadgets out of their skies and off their lawns.